It is an easy thing to overlook. Even if you think about it while brushing your teeth, you may still forget to pick up a new toothbrush the next time you go to the store. The standard length of time for a toothbrush to be in service is three months. If you have braces or other fixed orthodontic appliances, the metal surfaces can wear out a toothbrush much faster. Plus, you may find yourself brushing more often to remove food particles from around orthodontic appliances. The first thing that comes to mind is bacterial buildup. Bacteria are microscopic and not all of them rinse away. A toothbrush is not sterilized with hot water from the faucet. The temperature needed to sterilize a toothbrush would likely destroy it. The holes that hold the bristles can be a good breeding ground for bacteria. 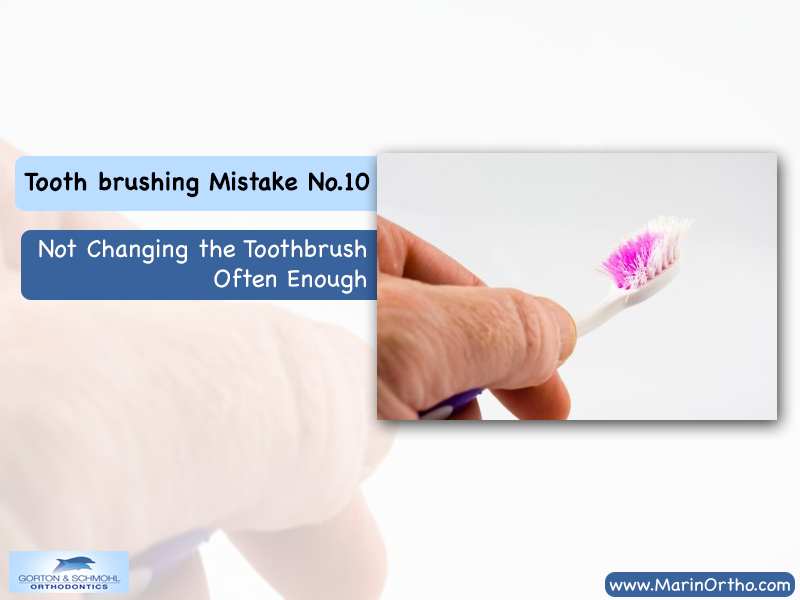 Also, the mechanical effectiveness of your old toothbrush is affected due to wear. Over time, the bristles begin to bend and flatten, reducing their effectiveness of removing plaque at the gum line and tooth surfaces. If you wear a removable dental appliance, such as a partial, or Invisalign braces that are in contact with your teeth for many hours of the day, you need a toothbrush in great shape to provide thorough cleaning of the gums and supporting teeth for partials and of your gums when wearing Invisalign products. Plaque can turn to tartar (calculus) in as little as 24 hours. Tartar needs to be scraped away during a cleaning the next time you visit your orthodontist. Partials and Invisalign can let the bacteria that forms plaque develop quickly on covered tooth and gum surfaces. Your toothbrush is one of the least expensive devices you can buy to help ensure your continued good dental health. If you have diabetes or other medical conditions that can have an impact on your dental health, your orthodontist may suggest you replace your toothbrush more often than every three months. Since toothbrushes are inexpensive, keep extra ones on hand. We also offer WowSmiles and Acceledent options to our orthodontic patients. Schedule an appointment by calling 415-459-8006 today.